I've been wanting to make a Beetroot version of Tahdig ever since I managed to find some rosy coloured barberries. Tahdig is a Iranian - Iraqi - Persian Upside Down Rice cake. I have made traditional Tahdig once before in a pot with crusty golden almost burnt topping, but that was well before I started this blog. 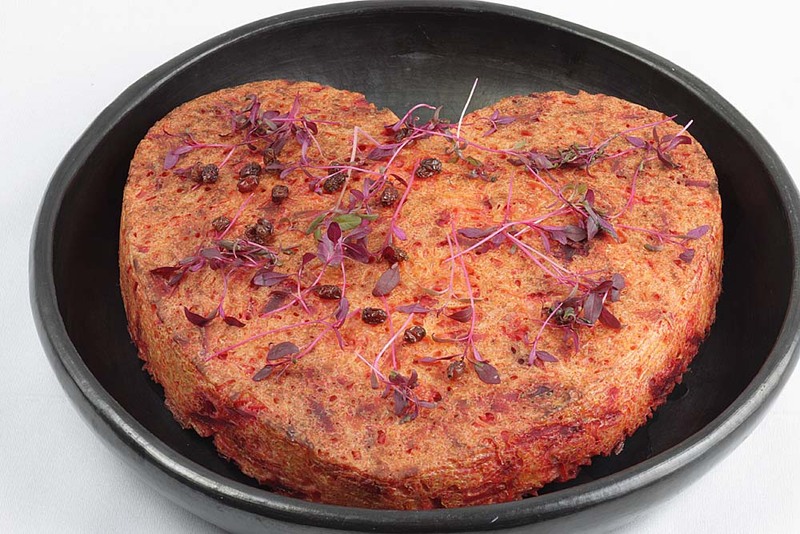 It is for this reason, I was confident I could adapt a Tahdig recipe with the addition of Beetroot. I was pleased by the way the savoury Persian style Upside Down Beetroot Rice cake turned out, baked in a silicon heart-shaped mould (because of Valentines week), BUT - yes there is a but, I was disappointed in the way it tasted. My tinkered version of this Persian style Upside Down Beetroot Cakes was just about edible, it needs work. 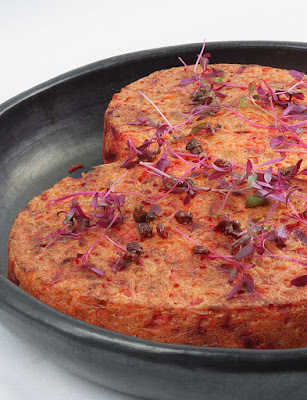 My version dyes the rice with beetroot instead of saffron and is filled with spiced roasted aubergines and puy lentils. The whole recipe needs a little tweaking, Nothing major, but the savoury beetroot rice was just a little over-cooked and more closer in texture to Beetroot Rice Pudding, plus the spicing was not quite right. Some of you may think well what is the point of sharing a flop of a recipe on your blog? Well mine is not a lifestyle blog, designed for a particular audience or purpose - its a real food blog and I think its important to share not just our successful recipes, but also our fails. This is a fail, even though I could have deceived you all and told you otherwise, as aesthetically it looks blooming marvellous, but what is the point - I would be fibbing to myself. 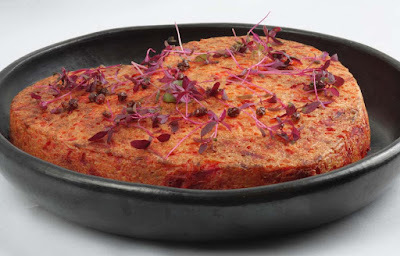 I will be giving this Perisan Style Upside Beetroot Rice Cake a go again in the future, come back if your interested. Adapted from this and this recipe. You're right, it does look amazing! I'm hoping to get some persian ideas for a Persian New Year feast around March. Thank you Mark. I have posted other flops on the blog, but its been a while. Well it does look amazing, even of it needs a tweak. We bloggers can all too often expect to get a dish right first time for the sake of having a post to publish, and it is seldom the case, in truth. Thanks for your honesty, and even a "flop" makes interesting reading :) Look forward to the final version. Thank you Sarojini. Your right we do sometimes have high expectations to get it right, i wonder how many bloggers lie about something tasting fantastic, when in fact its awful. I will try this again, but it might be a while, husband is still getting over it - No just kidding. Thank you so much Kari, I do hope to give it a go again - but if its for Valentines then it will be next year. Thank you Johanna, there was yogurt in the beetroot rice so I think it would not have worked as that was the major problem with it. I will make it again - but it won'd be heart shaped next time.